Railway reservation - Book your Indian Railway E-ticket now! The Indian railway reservation system allows you to book two types of tickets namely E-tickets and i-tickets. If you are not having a facility to take printouts at home and not having a valid identity proof then you have to book your i-tickets. In this case the railway reservation system courier you the i-ticket to your door steps. In case of i-tickets it is not essential to carry on your identity proof with you while you travel. The i-ticket facility is available in few cities so before you start to book ticket through railway reservation system, it is better to check whether you are having this i-ticket facility in your city. IRCTC railway reservation system has introduced another ticket by name E-ticket. 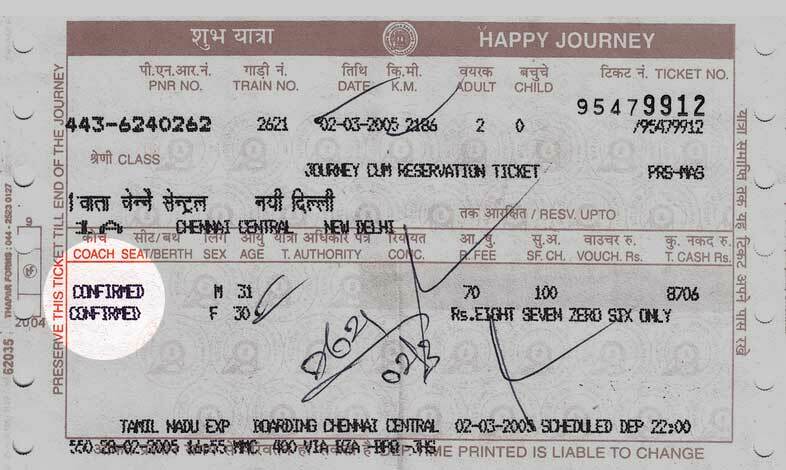 The E-ticket service was started by railway reservation system from the year 2006. IRCTC offers safe and secured online booking of tickets through this railway reservation system. In this E-ticket system you are not provided with any physical tickets. You have to take the print out of the ticket and carry this with you after the status has been changed to confirmed ticket. For E-tickets you have to carry your photo and identity proof while you travel in the train. Without this you will be considered and treated as if you are not travelling with a ticket. The E-ticket can be taken till the final chart of the train is prepared. Usually the final chart is prepared 4 hours before the train starts. If it is a early morning train then the the final chart is prepared on the previous day night. The cancellation of E-ticket is possible till the final chart is prepared. The additional charge involved in i-ticket is the courier and the postal charge for delivering the tickets. But in case of E-tickets the additional charge is the printing charge of the ticket. The physical ticket is couriered to your home in case of i-ticket and you need not carry any ID proof while you travel with i-Ticket. The E-ticket can be taken in the printed form but you should carry on your identity proof while you travel in the train. Without your ID proof, you will be considered and treated as if you are travelling without a ticket. You must book the i-tickets at least 2 days before the train starting date. In case of E-tickets you can book it till the final chart of the train is prepared. The cancellation charges are more for i-tickets. It cannot be cancelled online. The ticket should be taken to the counter in the railway station and then it has to be cancelled. It takes comparatively less charges for cancelling the E-tickets. The E-Tickets can be cancelled online. Recently Indian railways reservation system has launched an executive Lounge for the welfare of the passengers. Since every one want to spend their waiting time in a relaxed manner, the Indian railway reservation system has launched this scheme. A smart card will be issued to the person who checks in to the executive lounge. Families who travel in groups and marriage groups can enjoy this facility launched by Indian railway reservation system. For additional hours you have to pay additional charges as fixed by Indian railways. The executive lounges should be booked online only. As soon as you book your ticket you can book your executive lounge also though railway reservation system.